The TCs emphasized that leadership must be earned. 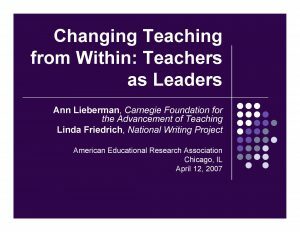 Being a teacher-leader means receiving (often informal) recognition from one’s colleagues for commitment to children, for high-quality teaching, and for willingness to share ideas (a rare quality among teachers working inside isolating school cultures).These teacher-leaders noted how their colleagues turned to them for advice about teaching writing. For example, Paul Epstein described what happened after he facilitated a schoolwide benchmark-setting process. Teachers from all grade levels sought him out informally for advice about how to teach writing; he was then able to share what he had learned from writing project colleagues as well as what he knew from his own classroom. 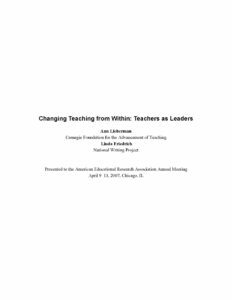 When the TCs redefined the term “teacher-leader” to mean these things—making a commitment to children, taking responsibility for contributing beyond one’s own classroom, working collaboratively as a fellow teacher—they felt more comfortable claiming the mantle of leadership.